Rows of multi-coloured tulips in full bloom is a sight to behold, and the lucky recent visitors to the picturesque Deolo Hills near here have been gorging on the veritable feast for the eyes. The tulip bulbs were planted in the expansive gardens of the Deolo Tourist Lodge, 5km from here, in December last year on an experimental basis, and they are in bloom now. The tourism department of the GTA had engaged Himalayan Florica, a Delhi-based company, to introduce tulip flowers in the hills to add another attraction for tourists visiting the hills during the spring. 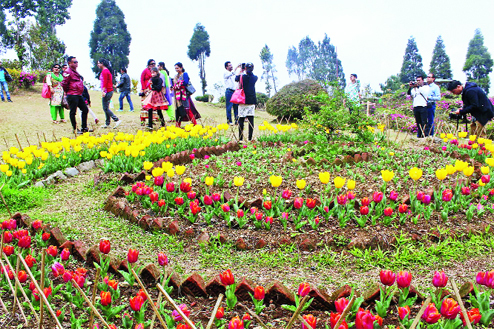 Neeraj Chhetri, the proprietor of Himalayan Florica, said he had spoken to GTA chief executive Bimal Gurung on introducing tulips in the hills some time last year. "Within days of my meeting with him, the GTA chief accepted the proposal and we chose three places to start tulip plantations on a trial basis. Apart from Deolo, we have planted tulips at Lal Kothi and Shrubbery Park in Darjeeling. While the flowers started blooming at Deolo about 10 to 12 days back, they are yet to bloom in Darjeeling," he said. Tulips grow from bulbs during the spring. The flower is shaped like a cup or egg and has six petals, and comes in various colours like cherry, orange, magenta, pink, crimson, and some more. "Tulips are grown mainly in hilly areas, but they had never been tried on such a scale in the Darjeeling hills. Their blooming depends on the climate and the altitude of the place. Since Kalimpong is warmer than Darjeeling, the flowers have bloomed early. We expect the Darjeeling flowers to bloom in April. This should actually be good because flower lovers among tourists can find tulips at different times in different places in the hills. If it is March in Kalimpong, it will be April in Darjeeling and other time in Mirik," said Chhetri. In all, 40,000 bulbs imported from Holland have been planted at the three places. "We had planted 18,000 bulbs in Deolo, and all have bloomed. Some plants were stolen. Next time, we will plant the saplings in an enclosed area. Tulips are a huge draw with tourists. There is a Tulip Park in Kashmir, which drew over 12 lakh visitors last year," he said. The other state in India where tulips are grown is Himachal Pradesh. Maya Bhattacharya, a tourist from Calcutta, got to see in Kalimpong what she couldn't in Kashmir. "I had been to Kashmir, but couldn't see tulips there. It was a pleasant surprise for me to see them in full bloom at Deolo," she said. The GTA chief executive, who has been camping in Kalimpong, said the experiment with tulip plantation had been a success, and more tulips would be planted at different tourist spots in the hills.